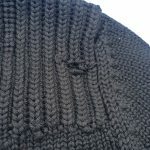 The center of this knit hat was unraveled and reknit. 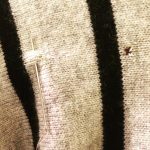 A hole next to the sewing needle was repaired and is now invisible. 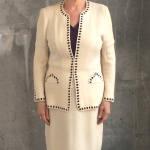 This vintage designer suit has been altered for a more flattering fit. 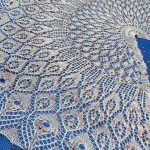 This shawl was blocked to show off the lace pattern. A large snag before repair. A large snag after repair. Was your favorite sweater attacked by moths? Is that boxy sweater a little too boxy? 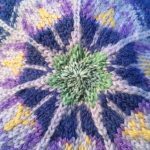 Do you have a newly knitted item that needs blocking? 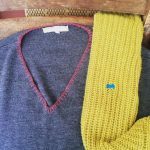 I can repair holes and alter knit items so you can wear them with pride. Call (510) 499 -8358 or email jarvis.ilah@gmail.com to schedule a free estimate. Bring anything you would like fixed or altered, and I will share what I can do. If I can’t fix your item I will refer someone who can. $25 for a single hole in one item, no size limit. $40 Up to five holes that are smaller than a dime in a single knit item. I offer special rates for multiple items. 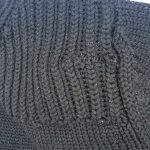 $50-$70 Alter machine knit items for a better fit. 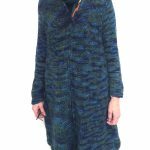 I will use my 25 years of experience as a knitter and seamstress to figure out a solution to your garment issues.